The fragile truce in eastern Ukraine has on several occasions been violated by an “unidentified third party,” the OSCE mission stated in its daily report, citing officers of the joint coordination center who were trying to organize a ceasefire. The OSCE Special Monitoring Mission (SMM) has witnessed three attempts by the Joint Centre for Control & Coordination (JCCC) to organize a ceasefire between Ukrainian troops and the self-proclaimed republics’ forces, according to the new report dated April 16. But within minutes after the arranged time, ceasefires were broken by a “third party,” Ukrainian and Russian officers tasked with mediating the truce told OSCE representatives. “According to both Ukrainian Armed Forces and Russian Federation Armed Forces officers at the observation point, an unidentified 'third party' was provoking the two sides,” the mission’s report says. “The SMM witnessed...[that] sporadic firing of mortars and machine guns started within a few minutes of the arranged [ceasefire] start time,” the report says. The SMM does not mention where the fire was coming from, nor does it name possible perpetrators of the alleged provocations. Eventually, Kiev forces and the militias did manage to secure a short ceasefire window from 13:07 to 15:37 local time as sporadic fighting around Donetsk continued throughout the day. 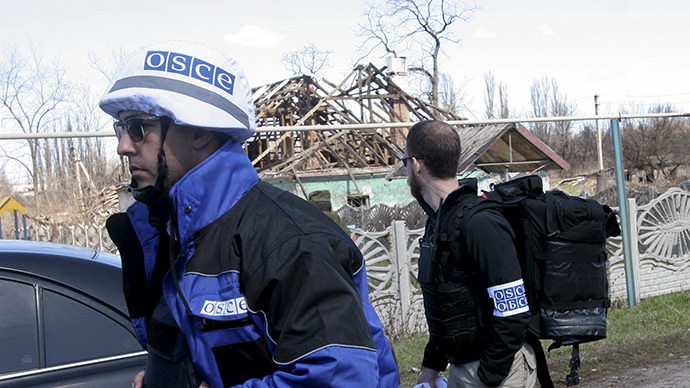 Overall the OSCE mission registered 18 separate cases of ceasefire violations on the day. Permanent representative of the self-proclaimed DPR, Dennis Pushilin, believes that the “third party” blamed for the provocations might be nationalist units, often privately funded, and not necessarily under the control of Kiev. Despite the earlier understanding that paramilitary forces in Ukraine will join the central command structure, a few rogue cells could still exist. “These battalions only half obey the central government. All provocations occur where Azov and Right Sector battalions are concentrated. Namely Shirokino area, Donetsk airport and Avdeyevka. This pushes the situation to a new conflict,” Pushilin said. “They want a new war and new blood. They aim to involve the Ukrainian armed forces in the conflict, although the Ukrainian army to a greater degree follow orders,” Pushilin said. Meanwhile the SMM also witnessed several violations of heavy artillery presence in areas that are supposed to be demilitarized following the Minsk II agreement. Using surveillance drones, the monitors observed violations in areas controlled by both sides of the conflict, including 21 Ukrainian tanks and six artillery pieces. Four howitzers towed by trucks and two tanks were seen on the territory under DPR's control. Over 6,000 people have died in the conflict in eastern Ukraine, which has lasted for over a year, according to conservative UN estimates. A peace roadmap, brokered by the leaders of France, Germany, Russia and Ukraine in February, dubbed the Minsk-2 agreement, stipulates heavy weapons should be pulled back from the frontline and that a security zone should separate the warring sides as they engage in a political dialogue to bring about a constitutional reform.